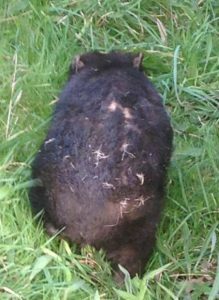 Wombat attack – Usually evident on the wombat’s rump. 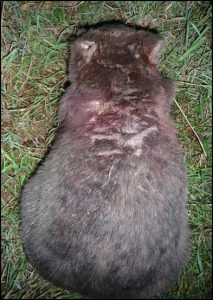 In severe cases, wounds can be seen from the top of the head all the way down the wombat’s back. Wombats are territorial by nature and don’t like to share their burrow or special area with other wombats. This can mean territorial disputes where they sometimes attack each other. Evidence of any wounds or fur loss on a wombat is usually diagnosed as mange. The difference is, wombat attack is mostly on the back/rump area which is protected by a bony plate (photos above). The wombat uses this like a shield when it gets chased into its burrow. 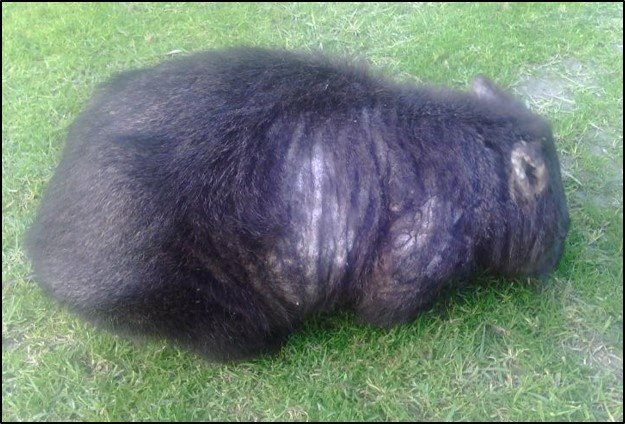 It can look very similar to mange due to the fur loss and/or open wounds, however the back on a mangy wombat is the healthiest area. Puncture wounds, tears or scratches from a dog attack are usually visible around the back of the neck and ears. 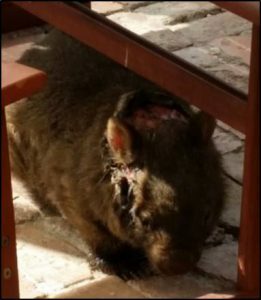 If there is a rotting dead smell this would indicate the wounds have become infected and the wombat needs to be reported so follow up assessment can be made. 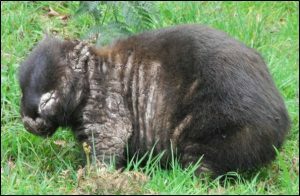 Mange is usually evident in the form of crusty ridges around the wombats shoulders, sides and legs. 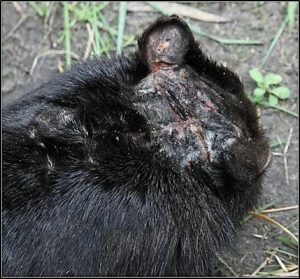 Scabs can also form around the wombats eyes and ears and the wombat may appear to be blind and deaf. Hair is usually still growing down the centre of the wombats back and rump and is often referred to as a ‘mohawk appearance’. Note: This is the best spot to administer pour on medication as it is more easily absorbed into the blood stream. Early signs of hair loss, very treatable. Not usually seen in daylight. 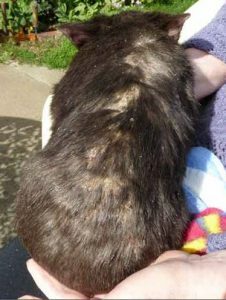 Crusty mange scabs may be seen on face, ears, sides and shoulders.This is the stage when they are seen in daylight hours. Wombat may or may not still be alert. The wombat is often reported to be blind and deaf and is easily approached. 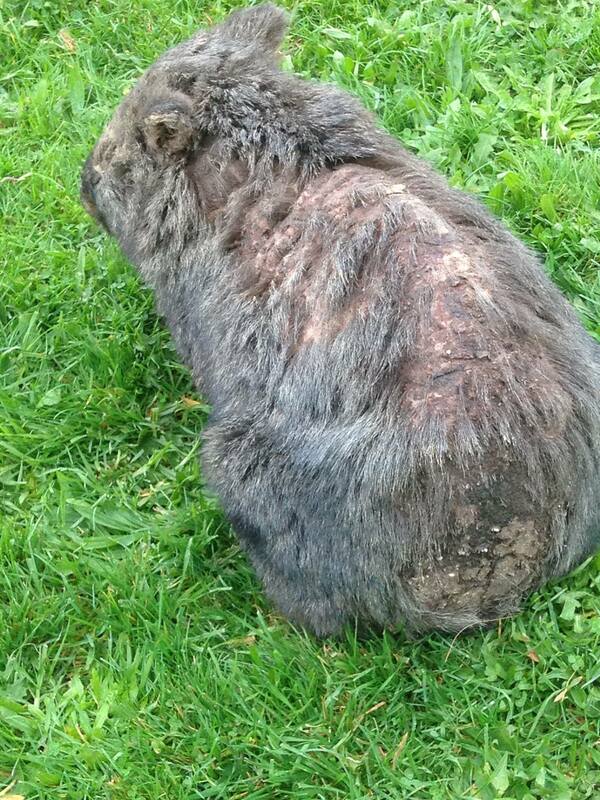 Wombats like this are still treatable if there are no infected wounds present. At this stage it is best to apply the Cydectin via a ‘pole and scoop device’ directly down the wombats spine. See treatment methods. Crusty scabs covering most of the wombats body. The scabs may have become infected at this stage and sometimes in the summer they can become flyblown. 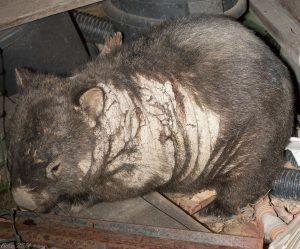 If the wombat is emitting a rotting dead smell, this usually indicates the infestation has progressed too far and secondary infection has developed. At this stage it is recommended to euthanize to avoid prolonged suffering. 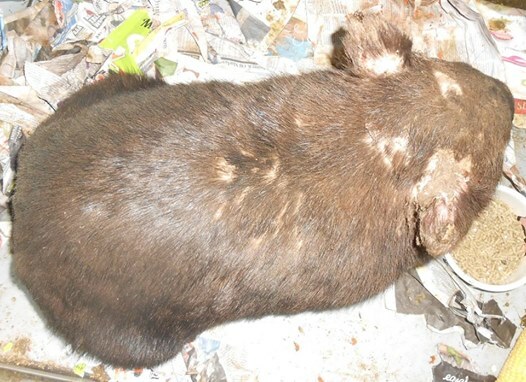 Following 12 treatments the wombat should be free of mange, gained weight as well as returned to its nocturnal habits.